Need fabric for a jewelry box? Paul Streicker knows a guy. Or a respirator for a fire department? Streicker can hook you up. How about safety flags for a construction site? Streicker can help you there, too. He owns Streicker & Company, a Providence firm that specializes in linking the needs of businesses to suppliers he represents. The industry calls it business-to-business marketing and the three-employee Streicker & Company chugs on in a trade dominated by major firms. “We’re the last man standing,” said Streicker, 64, from a tiny conference room in his offices as the family dog nipped at his heels. At the end of an industrial-looking, metal-framed building on a dead-end street, Streicker & Company is intentionally discreet. The focus here of Streicker, his graphic designer, his Internet specialist and his contracted staff is to promote the firm’s roughly dozen active clients and oversee special projects for the two dozen or so clients that hire Streicker on an as-needed basis. The company operates in an industry that rarely creates glitzy marketing campaigns, catchy jingles or brochures aimed at the average consumer. Instead, Streicker spends his days writing news releases aimed at company executives, putting together trade show displays and designing Web sites that pop up at the top of Internet searches. The words “Streicker & Company” usually never appear on the company’s work. 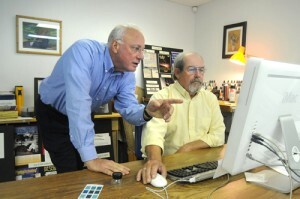 Streicker started the company in 1975 in his bedroom with two filing cabinets. The year before, the now-defunct Providence advertising agency Creamer Trowbridge Case & Basford laid off Streicker, who was a copywriter there. Resume in tow, Streicker went around to small Rhode Island advertising firms seeking clients. It was slow going at first. Streicker picked up his first client, the now-closed Pac Foam Co., after a friend still working at Creamer Trowbridge Case & Basford referred the company to Streicker. Since then Streicker & Company has picked up new clients and tended to keep them. Streicker said the average client has been with him for 11 years, an astounding timeframe in a market dominated by big players with even bigger wallets. But Streicker said he can provide a personal touch that large firms with layers of bureaucracy cannot. Plus, the slimmer organization means less overhead and better deals for clients. And it does not hurt that the company’s founder enjoys his job. One moment Streicker is learning about deep-drawn stampings, the next minute he’s getting up to speed on high-energy density capacitors used primarily in military applications. He is also learning how to position his business in a rapidly evolving market. The introduction of the Macintosh computer “changed everything,” Streicker said. Production timelines shrunk dramatically and anyone and everyone with a computer started to offer marketing services. Then came the widespread introduction of the Internet and the concept of search optimization. Streicker & Company dove into that arena in the mid-1990s, positioning itself early in what would be an explosive sector of the market. The Internet even changed how the firm markets itself. When Streicker first started out, he listed his company in the phonebook and made cold calls. Today, clients find him on the Web and 20 percent do it from mobile devices. The company has also benefited in a way from the recession. As companies cut costs and axe marketing personnel they turn to Streicker & Company. Streicker said he sometimes worries that the exodus of manufacturing from the state will leave him with no clients, but for now the company remains on track to record the same sales this year, between $500,000 and $1 million. The biggest threat right now to Streicker’s business may just be his wife, Kathie. Streicker said after more than three decades at the company and time before that as a reporter, editor and a handful of odd jobs, his wife is ready for him to move on. But will he leave soon?